1889 Enoteca lives in what was once, in 1889, a shopfront on Logan Road at Woollongabba ('the Gabba' to locals, because Woolongabba has too many syllables). It's a perfect example of a how perfect a bistro can be when it takes care and continues doing what it does best - great Italian food and a superb collection of Italian wines. It was great to have a chance to eat there again this week, and wonderful to see that it's as good now as when it opened two years ago. 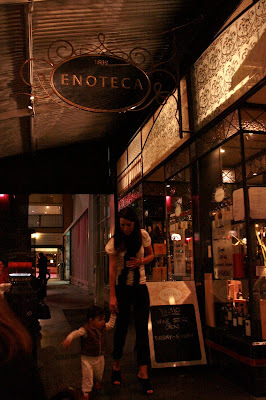 Restaurant goers are fickle creatures, and so Enoteca must be doing something really, really right. The menu is deceptively simple. I started with a loin of rabbit on polenta with pecorino, but this description fails to do justice to the dish, which had been executed with a light touch and perfect balance. The Granite Belt rabbit loin had been been gently and tenderly cooked, and was sliced into pink-tinged petals sitting over a bed of white polenta made on fresh cream and stock. The salty flakes of pecorino added depth to the rich polenta as they melted into it. Kingfish with lentils and pancetta hid a dish of such complex and robust flavours - the fish was sweet and tender, with a layer of crisped skin, and sat on a bed of richly savoury green lentils studded through with big falt salty cubes of pancetta, all surrounded by a herby, lemony, garlicky salsa verde. A fabulous hearty fish dish. I wish I could tell you the name of the wine that went so well with it, but by this stage I had begun with a superb prosecco, the match of any French champagne, moved onto soave, and now I had stopped looking at the labels and was just enjoying the flavours. It was a red. Nebbiolo? Barolo?There are no photographs of the food because the long exposure required was a struggle with all that wine I'd enjoyed. You'll just have to enjoy the descriptions, although I can tell you the dishes looked as beautiful as they sounded. For dessert I was dying to try the vanilla pannacotta with berries, pistachios and strawberry doughnuts, but I was done in by the taste of a tiramisu done so well it was pointless trying to better it. An incredible dinner, amazing wines. It just reminds me of how far Brisbane has come in the last few years.